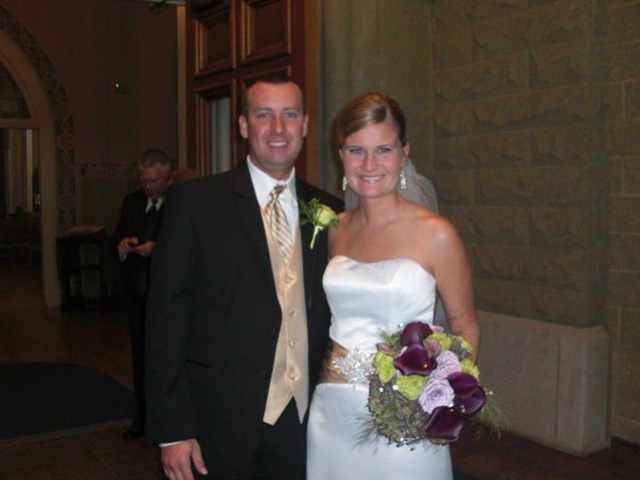 Josh & Jenny were married at St. Mary Cathedral in Lafayette, IN. 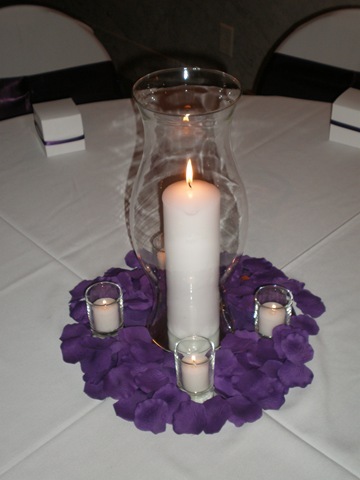 The couple used plum as their main color for the wedding and accented with green. It was a beautiful sunny day for the couple. The day started off with a lunch hosted by the mother of the bride and then the couple took pictures at St. Mary Cathedral and throughout downtown Lafayette. 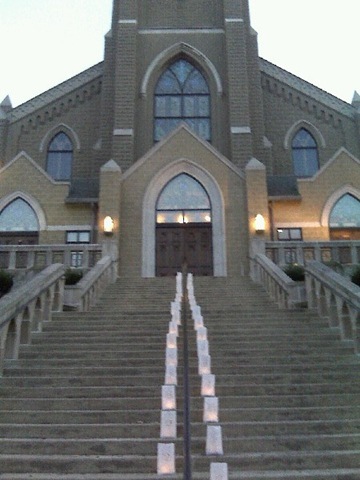 The stairway leading from the church was lined with luminaries as the couple left the church at dusk. The couple along with the bridal party left in a horse led wagon. 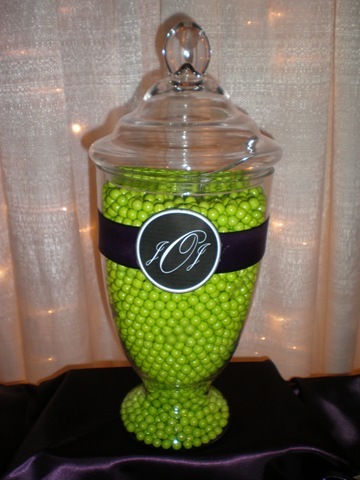 The custom designed programs incorporated the bride and groom’s initials in a monogram that was also used at the reception. 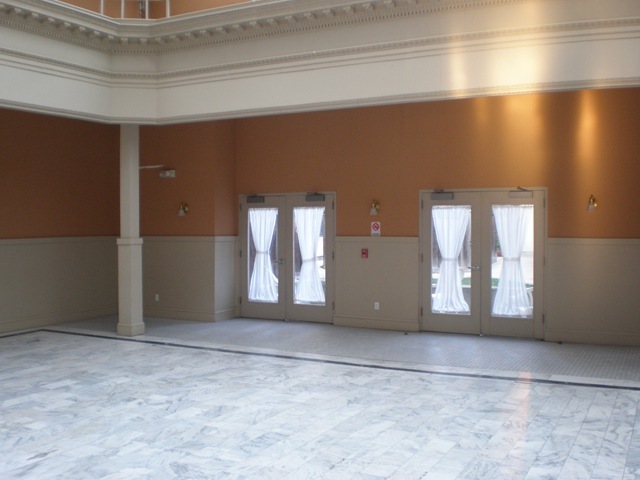 The reception was held at the historic Lahr Atrium located next to the Knickerbocker Saloon in downtown Lafayette. The venue, previously a historic hotel, served as the perfect setting for the intimate dinner hosted by Sovereign Catering. 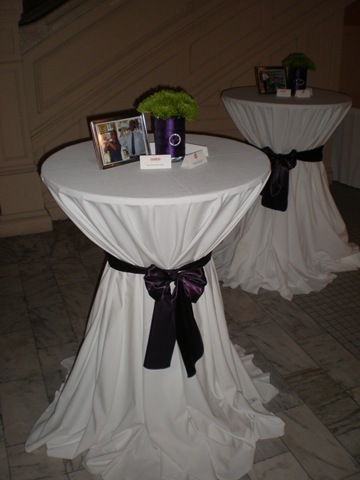 A combination of round and banquet tables were used to seat the 200 guests. 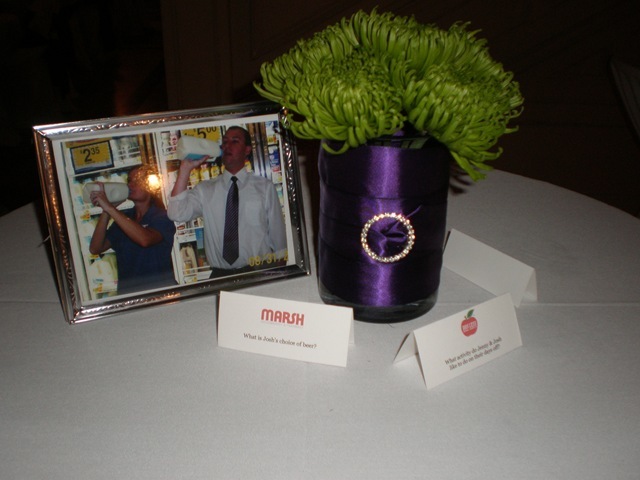 The couple work at competing grocers so the cocktail tables featured trivia questions and pictures of Josh and Jenny posing at the grocery store. The highlight of the bridal party entrance was Josh pushing Jenny in a grocery cart as they entered the reception together as husband and wife. 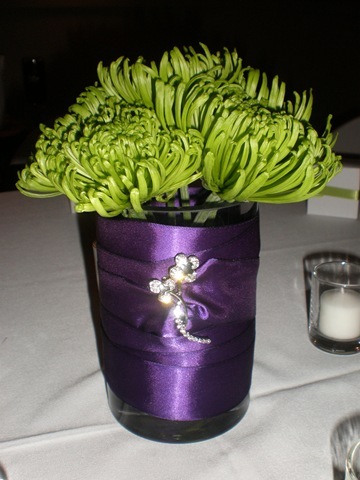 The centerpieces were created by wrapping ribbon around vases and then gathering the ribbon together with a broach. 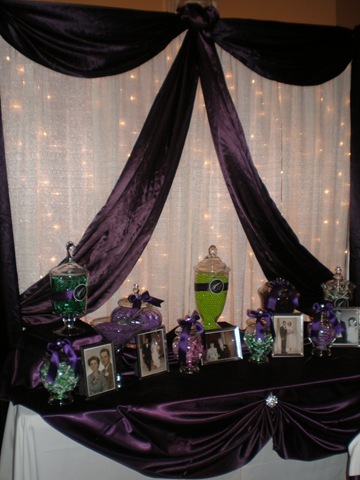 A candy buffet was created so that guests could help themselves through out the evening. 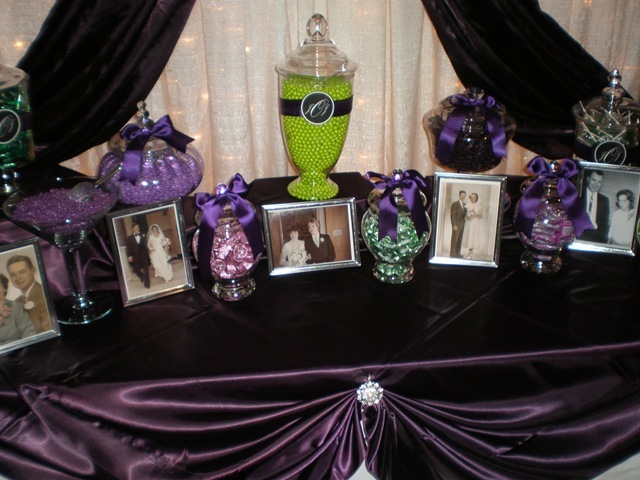 The table showcased the bride and groom’s parents and grandparents wedding pictures. 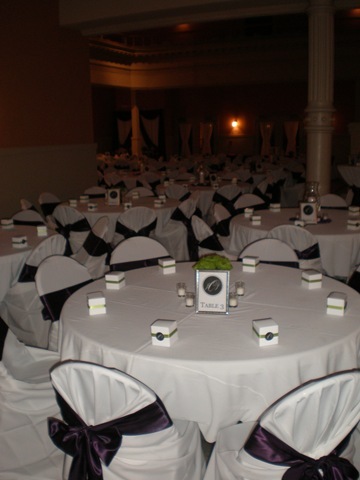 on February 11, 2011 at 5:25 pm | Reply Nija P.
I’m wondering how much room there is for a dance area with 200 guests, as our reception will be near that number (which is why we may have it at a different venue). 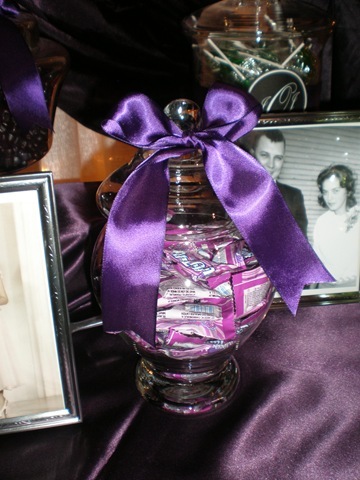 I love the idea of a candy buffet, and really like how the parents and grandparents were incorporated into it. Thanks for sharing these pics, keep them coming. Hi! I too am having my weddig reception at the Lahr Atrium. 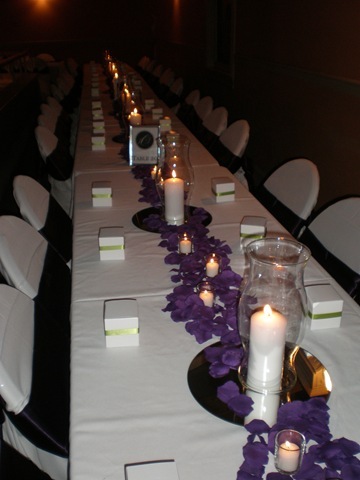 I just wanted to ask you how Sovereign Catering & Events did with the food and everything involved? I’ve had a hard time reaching the owner and recently just heard a really bad horror story so its making me a bit nervous! Just thought you might have an opinion! 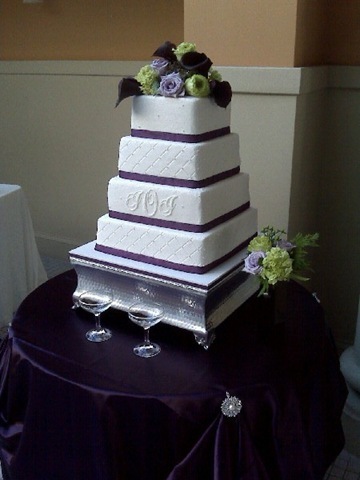 Your wedding was beautiful! Thank you! They did a great job, were very accomodating and enjoyed working with them.